I should start at the beginning. 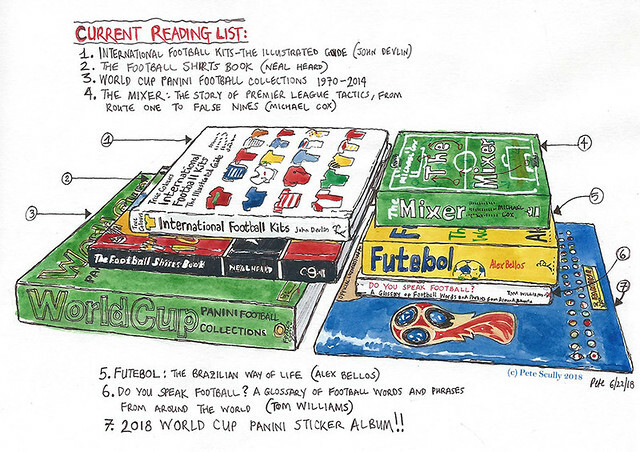 I should start in england, with the few sketches I did there, and with stories about watching England win and then lose in the World Cup, with the heatwave of London proving too much for my air-conditioned Californian constitution. 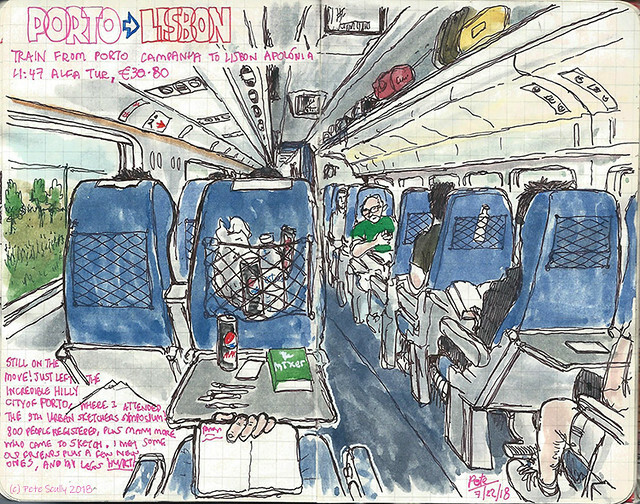 I should maybe even add my sketches of Madrid first, since they at least are all scanned now; one of the great things about coming back from a trip where you fill an entire sketchbook in a short amount of time is that there is so much scanning to do to digitize them when I get home. I always do that as I go along, a point that came in handy for my ten-year retrospective exhibition in 2016. I could dive straight into the Porto symposium, although I am still digesting my experiences there, and figuring out what new things I have learned (something that may take me months). So I will start with the easy stuff, the fun stuff, the thing that I am known for the most (actually the second-most – I certainly got the “oh you’re the one who holds his pen in a funny way” more than “oh you’re the one who draws the fire hydrants” this time when meeting new people.). 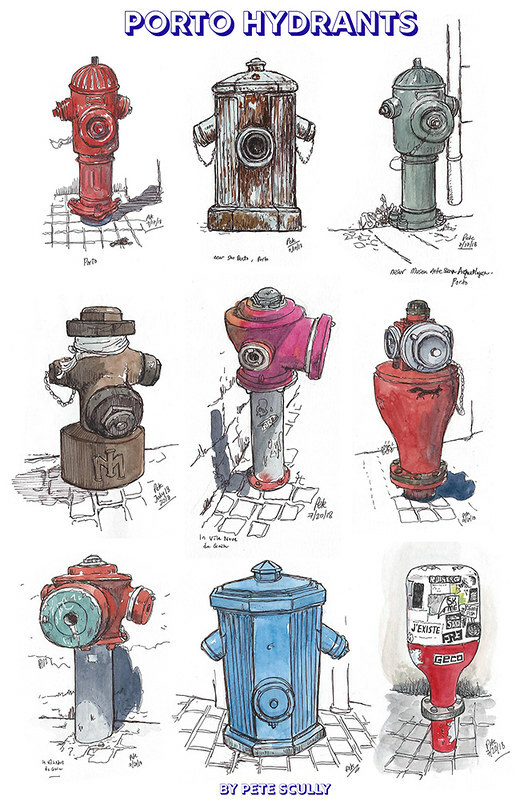 I sketched fifteen hydrants in Portugal, nine in Porto and six in Lisbon (quickly checks my maths). 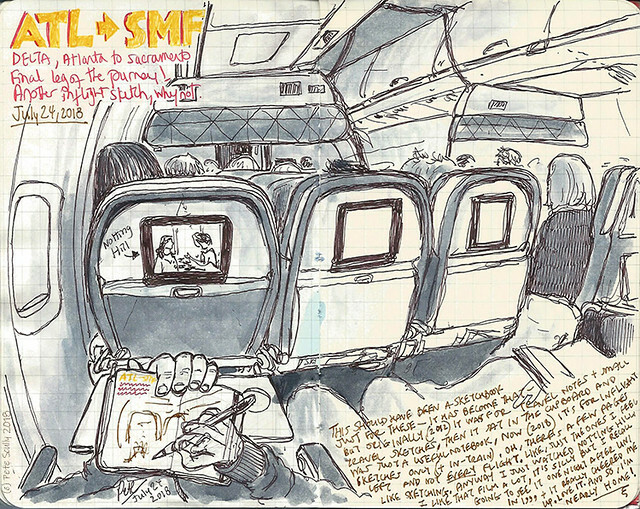 Actually I just realized there was one more, but it is small and part of a larger reportage sketch so doesn’t count. 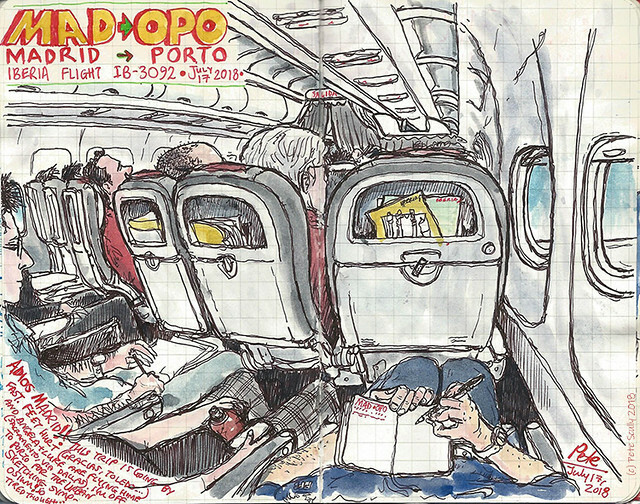 For a close view, here they all are – and I have tried my best to remember where they all are, but I didn’t write it down as I often wasn’t sure where exactly I was when I sketched them, Porto is a little bit like that. This little red one was at Rua Chã, near the Cathedral and not far from my hotel. Now I must tell you that the little scribble in front of the hydrant, that was dog poo. No, I’m not saying there was a lot of dog poo in Porto because there wasn’t, it’s not like Charleroi in the 90s. What I’m saying is that if you have dog poo in your sketch make sure you keep it in the drawing. 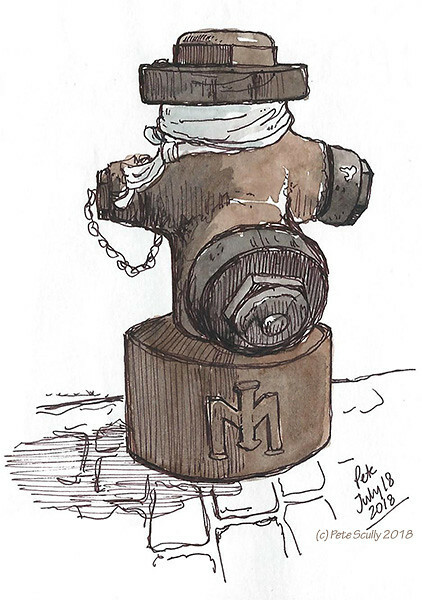 This is a pretty standard hydrant for Porto, though the big bulky silver ones were common as well. This model was very exciting, not only to me but to everyone else who was excited to see unusual fire hydrants on my behalf. 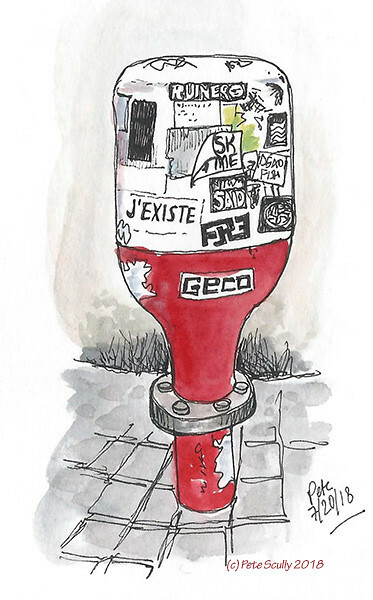 I opted to draw a really rusty version, which was across the street from the Sao Bento station. 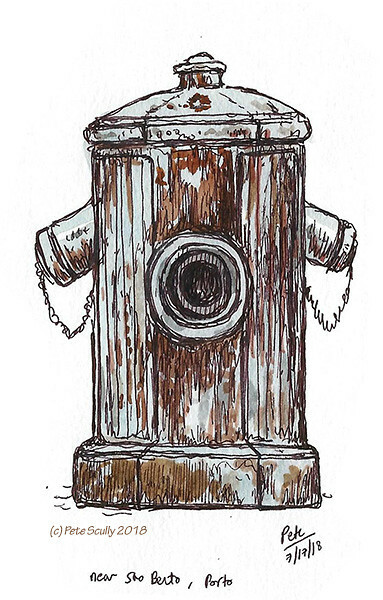 Rusty hydrants are beautiful, and give off that used-universe vibe. They would look great in Mos Eisley. Now this little oxidized beauty was on a very steep street next to the Igreja Dos Grilos (and the Museu de Arte Sacra e Arqueologia according to the sign I read), but I didn’t go further down that mazy street as I was getting a little lost, so climbed back up. It’s similar to the first one but not painted red. On my second evening in Porto I got a bit lost (to say the least) trying to find my hotel, which as it turns out was at the top of a very steep hill with a few different routes to get up there, none of them particularly great. 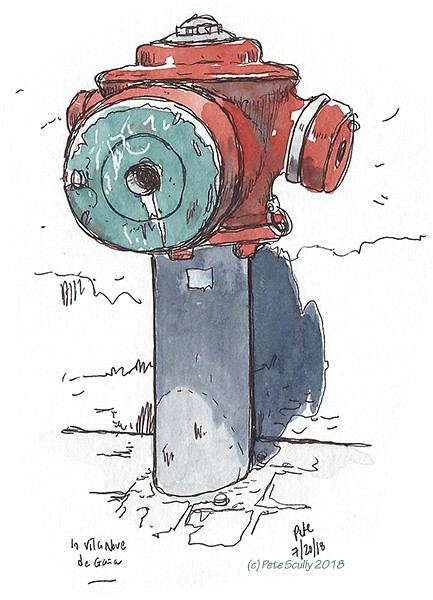 I stopped for a rest at one point when I saw this little hydrant in an alley in Ribeira, looking like it had been blindfolded and abandoned. It reminded me a bit of a young Scott Summers. There was wine bar just opposite. 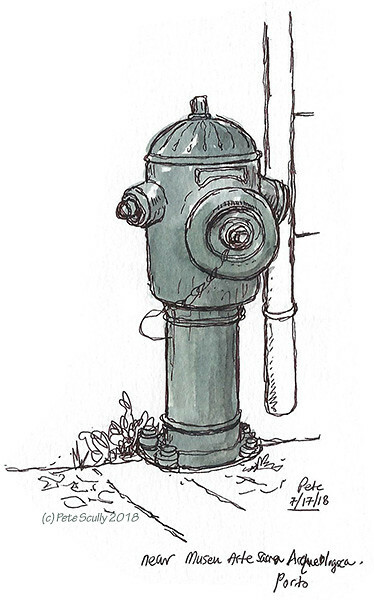 It took me 45 minutes to walk back to the hotel in the end (well I will stop to sketch hydrants). Perhaps I should have called a cab, but I’m an explorer after all and I need to sue my own two feet (my two very tired feet, those Porto hills are a nightmare). Ooh now this was an exciting find. I was over in Vila Nova de Gaia, which is on the other side of the Douro river. Technically not really Porto any more but it totally is. I crossed the enormous Ponte Luiz II bridge via the road at the top, and after sketching the view of the river I tried to find my way down. That wasn’t easy. 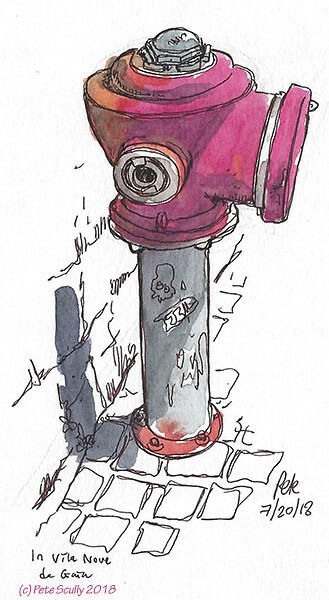 I’m sure there is an easier way down than the long steep quiet path that I took, but I found this hydrant painted in bright pink which I just had to sketch. Now this model is one that usually have a big plastic lid on it. 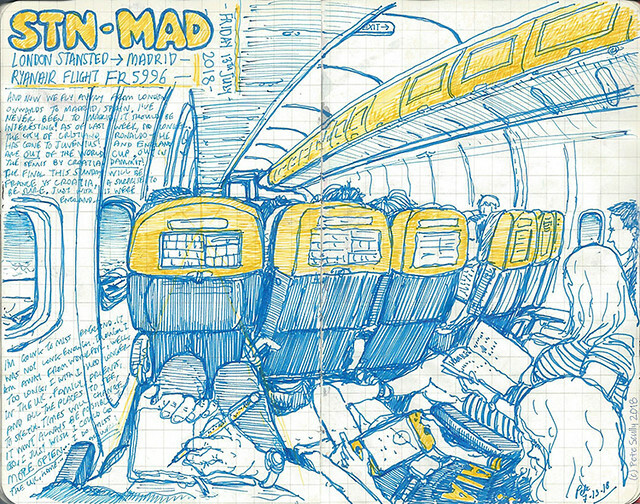 I sketched ones like this in Lisbon, years ago. They do look a bit like overturned wine bottles. This one had no lid however, and I was drawn to it because someone had stenciled a picture of a fox onto it. 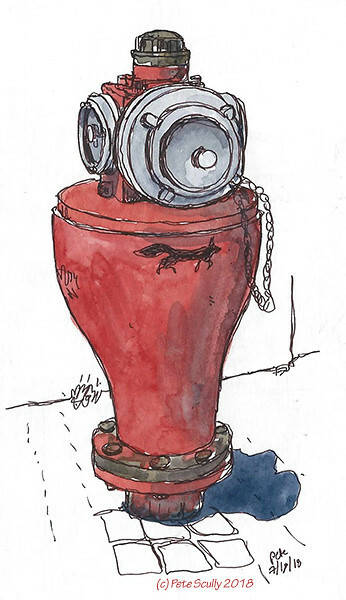 I had seen this fox all over Porto, on the side of buildings and fences, sprayed onto the cobblestones on the ground, and now here on a hydrant. I did not figure out the fox’s significance (because I never actually asked anyone, surprise surprise). The Portuguese word for ‘fox’ is ‘raposa’. I don’t know what the word for ‘do some deeper research’ is though. This one was found next to the Palacio da Bolsa, on Rua Ferreira Borges. This is another one from Vila Nova de Gaia which I sketched on the way down the mountain, same model as the pink one you may remember from a couple of paragraphs back. I never saw this model on the other side of the river, which doesn’t mean they don’t have it, just that I never saw it. This bright blue version of the second one is found on Rua das Flores, in Ribeira. OR it was Rua Mouzinho da Silva. I can’t remember. Maybe it was neither. It was very blue though. Now THIS one was on Rua Mouzinho da Silva. That is a main street that goes from Sao Bento downhill into the Jardim do Infante Dom Henrique. Henry the Navigator, as he was known. I should have had a similar nickname, for the amount of times I got lost in Porto. This one I am calling ‘J’Existe’ because of the sticker on the top. This as you can see is one of those ones that is covered up with a nice Kinder-Egg style lid. 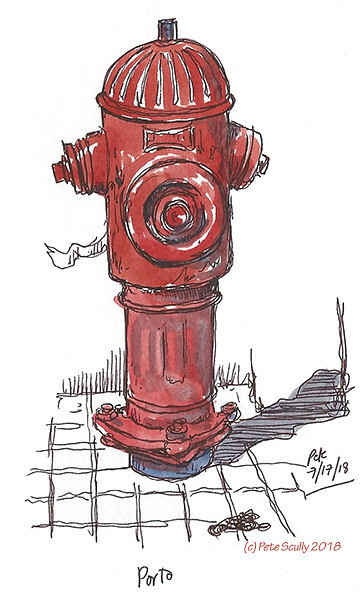 And there you have it, my Porto hydrant sketchers. I’ll post the Lisbon ones separately. But finally, I didn’t draw this one but it made me laugh anyway, because of the owl sticker, and because it looks a bit strange. 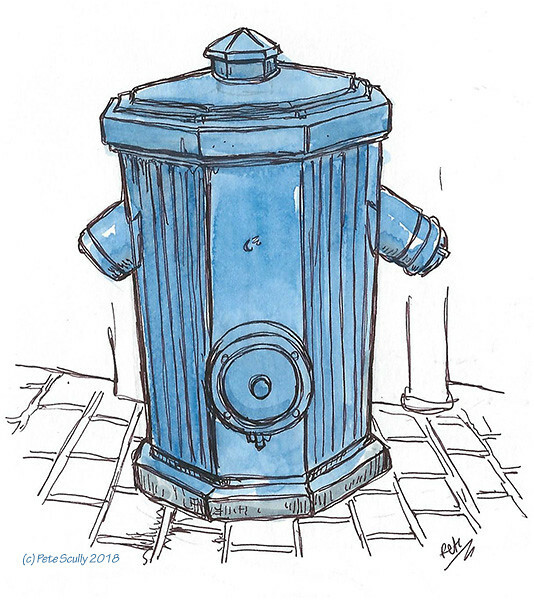 PS I originally titled this post ‘Porto Hydrants’ but changed it to ‘Porto Pumps’ to match my blog theme of ‘Porto + P-Word’. Editorial consistency! 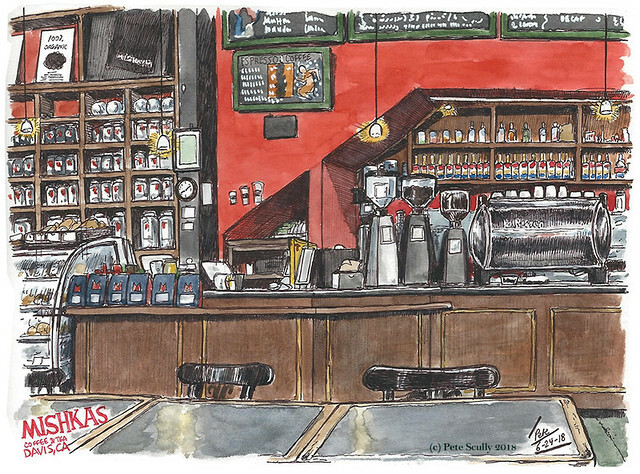 This is the interior of Mishka’s Cafe on 2nd street, Davis, as much a staple of Davis life as anything. I don’t actually come here very often myself (I don’t drink coffee, though of course they serve more than coffee) (I never drink tea other than at home, except in England where it’s just how I like it) but a lot of people do. It opened in 1995 in a different location, and I sketched there on the very first sketchcrawl I ever went on in Davis (December 2005, wow). That spot closed when Mishka’s moved a block down the street to a new building next to the Varsity, where the old tank house used to be, opposite the Avid Reader. 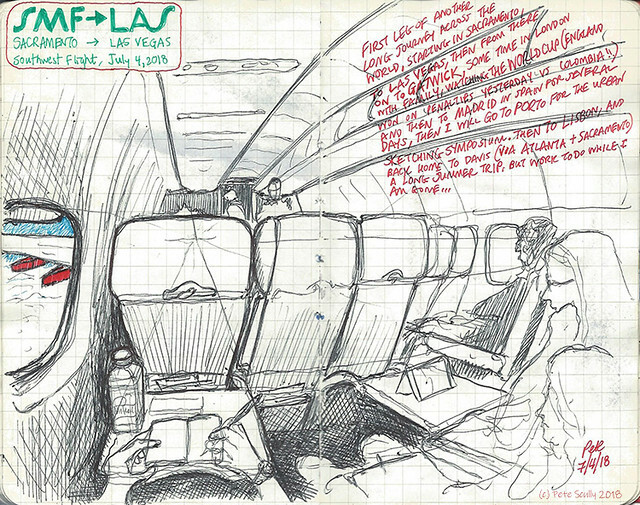 I’ve never sketched in this newer location (though I drew the outside in 2012). As I say I don’t drink coffee but I do drink lovely fruit smoothies, and I had a delicious mango smoothie, followed by a very sweet wild berry smoothie (bit too sweet after the mango one). It was a Sunday evening, I had been stuck in the house for the whole weekend and needed to get out for a bit, and draw something in my sketchbook. It was not crowded there. There are still a few places I want to draw the interior of here in Davis. Tres Hermanas has a really interesting vibe, while Our House has one of those big mirrors I like to draw the reflections in. I have gone to Woodstocks Pizza to draw before but ended up leaving because I couldn’t settle into a good spot, and I wanted to draw inside that Italian restaurant over near Olive and Richards but I think it has closed now. In this hot weather, I’m on a quest for some interior sketching. Below is a sketch of Mishka’s previous location, from over 10 years ago! 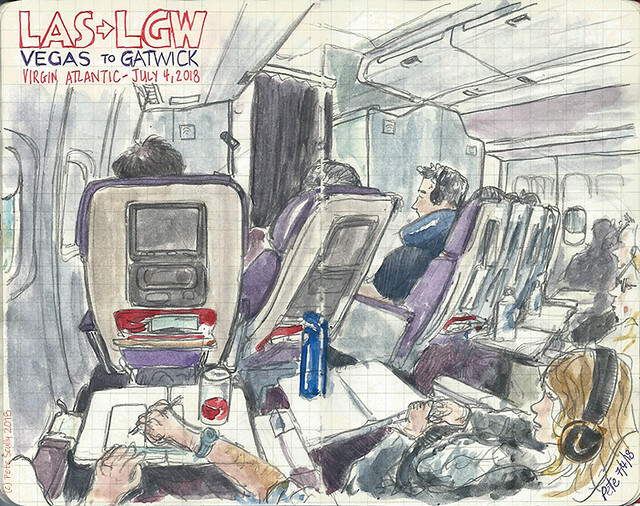 There is fellow Davis sketcher Alison Kent. This was an earlier Davis sketchcrawl. I had a wild berry smoothie that day too. 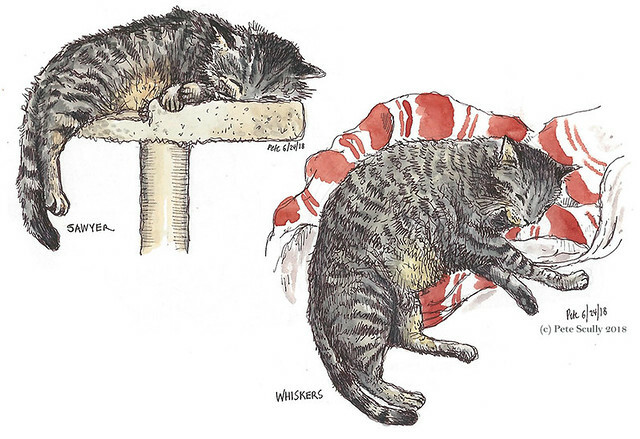 I have been reluctant to become a pet-sketcher, but our two young two cats, Sawyer and Whiskers, aka the Banes of My Life (I love them really), stayed still long enough for me to draw them during one of the less entertaining World Cup matches.They are very sweet when they are asleep. They look almost identical (they are brothers) but have remarkably different personalities. Sawyer is a whiner who likes to jump on high shelves, Whiskers likes to steal things and take them under the couch. Whiskers also likes my computer chair and does not like it when I want to sit down, and tries to push me off. Sawyer thinks hunting flies and moths is the best thing ever invented. He probably thinks his name is “Get Down”. They both love the laser pointer. Whiskers likes rolling around in my dirty laundry. They barely tolerate my existence otherwise. The knockout stages of the Russia 2018 World Cup started yesterday. The first game was ridiculous, with France winning 4-3 against Argentina, Messi dropping his head while 19 year-old Mbappé turning up the speed. Kylian Mbappé, by the way, was born AFTER France won the World Cup in 1998. Incredible. Messi on the other hand just stood there after the final whistle, while various people came and tried to hug him. Portugal v Uruguay was a tighter affair with some good football – that cross-field pass from Cavani to Suarez, so that Suarez could cross it back for him to head home, was a thing of utter beauty, bettered only by Cavani’s superb second goal. I felt bad for Portugal, and of course out went Cristiano Ronaldo. I like Ronaldo, and particularly love the way he pulls his shorts right up when taking a free kick. This morning, we got up early again to watch Spain vs Russia. These early morning get-ups are getting old fast. I interspersed iot with watching the Formula 1, the Austrian Gran Prix, and somehow contrived to miss the best bits of both events. 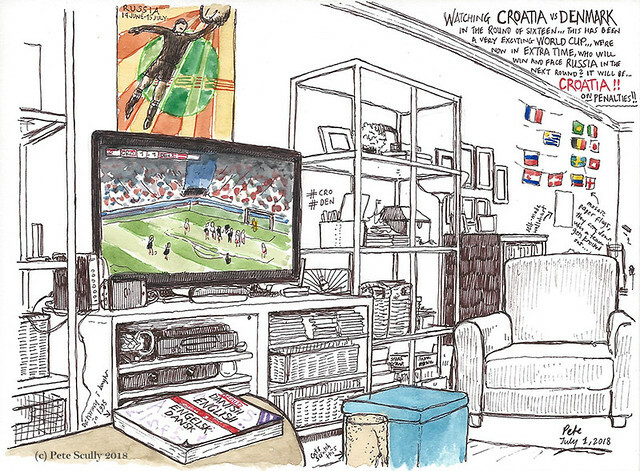 We did watch extra time, and of course the penalty shoot-out, and to our surprise Spain lost. Now I had originally predicted Argentina to win the World Cup, if you saw my long posts with all the kits, and that obviously didn’t work out, so I switched my prediction to Spain. Mystic Pete strikes again eh. So just to be safe and guarantee an England victory on Tuesday, I am predicting Colombia will win the World Cup, definitely for sure, they are gonna do it. Ok, so for today’s second game I parked myself on the couch and watched as Croatia and Denmark battled it out for a 1-1 draw. 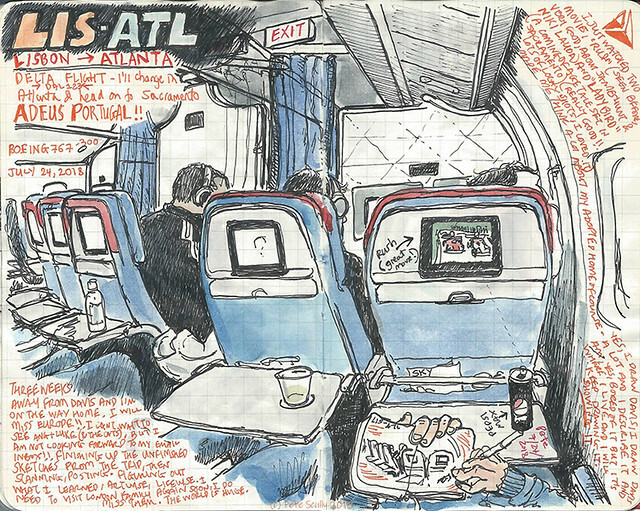 I sketched from the couch – see the picture above. In the distance you can see our paper mosaic flags. When a team is eliminated the flag is taken down. Above the TV, the official World Cup poster. And on the couch next to me, the Berlitz Engelsk-Dansk dictionary which I bought in 1995 ahead of my summer picking strawberries in Denmark. Yes I would wake up at 4am and pick strawberries on a farm in southern Funen, so you might say this isn’t the first time I’ve been up early rooting for Denmark. In the end it came down to a battle of the keepers, and though the Danes had the heroic Kasper Schmeichel, son of the Great Dane Peter himself (in case you missed it when the commentators mentioned it like a thousand times), the Croatian goalie saved one penalty more, and Modric and friends go through to meet Russia in the quarter finals. And I got another living room sketch out of it. It’s so hot these days I’m not sketching outside much.